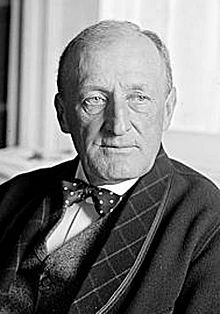 James Clark McReynolds (February 3, 1862 – August 24, 1946) was an American lawyer and judge from Tennessee who served as United States Attorney General under President Woodrow Wilson and as an Associate Justice of the United States Supreme Court. He served on the Court from October 1914 to his retirement in January 1941. He was best known for his sustained opposition to the domestic programs of President Franklin D. Roosevelt and his overt anti-semitism. Born in Elkton, Kentucky, McReynolds practiced law in Tennessee after graduating from the University of Virginia School of Law. He served as the Assistant Attorney General during the administration of President Theodore Roosevelt and became well known for his skill in antitrust cases. After President Wilson took office in 1913, he appointed McReynolds as his administration's first Attorney General. Wilson successfully nominated McReynolds to the Supreme Court in 1914 to fill a vacancy caused by the death of Associate Justice Horace Harmon Lurton. In his twenty-six years on the bench, McReynolds wrote more than 506 majority opinions for the court and 157 dissents, 93 of which were against the New Deal. McReynolds was part of the "Four Horsemen" bloc of conservative justices who frequently voted to strike down New Deal programs. He assumed senior status in 1941 and was succeeded by James F. Byrnes. During his Supreme Court tenure, McReynolds wrote the majority opinion in cases such as Meyer v. Nebraska, United States v. Miller, and Pierce v. Society of Sisters. Born in Elkton, Kentucky, the county seat of Todd County, he was the son of John Oliver and Ellen (née Reeves) McReynolds, both members of the Disciples of Christ church. John Oliver McReynolds was active in business ventures and served as a surgeon in the Confederate army during the Civil War. The house in which James Clark McReynolds was born still stands;[A] it was listed on the National Register of Historic Places in 1976. He graduated from the prestigious Green River Academy and later matriculated at Vanderbilt University, Nashville, Tennessee, graduating with status one year later as a valedictorian in 1882. At the University of Virginia School of Law, where he studied under John B. Minor, "a man of stern morality and firm conservative convictions," McReynolds completed his studies in fourteen months. He again graduated at the head of his class. McReynolds received his law degree in 1884. He was secretary to Senator Howell Edmunds Jackson, who later became an associate justice in 1893. McReynolds practiced law in Nashville and served for three years as an Adjunct professor of Commercial Law, Insurance, and Corporations at Vanderbilt University Law School. He became active in politics, running unsuccessfully for Congress in 1896 as a "Goldbug" Democrat. [B] As head of the Tennessee delegation to the 1896 Democratic Convention, he wrote the party's "sound money" plank. Under Theodore Roosevelt, McReynolds served as Assistant Attorney General from 1903 to 1907, when he resigned to take up private practice with the noted law firm of Guthrie, Cravath, and Henderson (later renamed Cravath, Swaine & Moore) in New York City. While in private practice, McReynolds was retained by the government in matters relating to enforcement of antitrust laws, particularly in proceedings against the "Tobacco trust" (see United States v. American Tobacco Co., 221 U.S. 106 (1911)) and the combination of the anthracite coal railroads. The case which brought him to the attention of President Wilson was the government's case against the American Tobacco Company, in which McReynolds presented the government's case, while the company was represented by Clarence Darrow and 17 other attorneys. On March 15, 1913, following the successful conclusion of this case, with Attorney General Wickersham's recommendation, Wilson appointed McReynolds as the 48th United States Attorney General; he served until August 29, 1914. During his time in private practice, McReynolds earned a reputation as an ardent 'trust buster', and he continued working against trusts during his time as the US Attorney General. In spite of his negative views of corporate monopolies, McReynolds was very supportive of laissez-faire economic policies. Wilson found him difficult to work with. On August 19, 1914, Wilson appointed McReynolds to the Supreme Court, to a seat vacated by the sudden death of Horace H. Lurton. McReynolds was confirmed by the United States Senate and received his commission the same day, starting with the new term on October 12, 1914. When the Supreme Court Building opened in 1935 during the Great Depression, McReynolds, like most of the other justices, refused to move his office into the new building. He continued to work out of the office he maintained in his apartment. He said that, with the country in economic turmoil, the government should not have spent so much money on a single building. He ignored the fact that many people had been put to work because of the project. In his 27 years on the bench, McReynolds wrote 506 decisions, an average of just under 19 opinions for each term of the Court during his tenure. In addition, he authored 157 dissents, 93 of which were against the New Deal. His fierce opposition to Franklin Roosevelt's New Deal legislation designed to provide relief to citizens and put people to work during the Great Depression resulted in McReynolds being classified as one of the "Four Horsemen", along with George Sutherland, Willis Van Devanter and Pierce Butler. McReynolds voted to strike down the Tennessee Valley Authority in Ashwander v. TVA, the National Industrial Recovery Act in Schechter Poultry Corporation v. United States, the Agricultural Adjustment Act of 1933 in United States v. Butler, the Bituminous Coal Conservation Act of 1935 in Carter v. Carter Coal Co., and the Social Security Act 42 U.S.C.A. § 301 et seq. in Steward Machine Co. v. Davis, 301 U.S. 548, 57 S. Ct. 883, 81 L. Ed. 1279 (1937). He continued to vote against New Deal measures after most of the Court shifted in 1937 to upholding New Deal legislation. Howard Ball called McReynolds "the most strident Court critic of Roosevelt's New Deal programs". As a confirmed opponent of federal authority aimed toward social ends or economic regulation, he had the "single-minded passion of a zealot". McReynolds was a "firm believer in laissez-faire economic theory", which he said was constitutionally enshrined. After the "Lochner era" ended in 1937—the Court's "switch in time that saved nine"—McReynolds became a dissenter. Unchanging through his 1941 retirement, his dissents continued to decry the federal government's exercises of power. In Steward Machine Co. v. Davis 301 U.S. 548 (1937), he dissented from a decision of the Court upholding the Social Security Act. He wrote: "I can not find any authority in the Constitution for making the Federal Government the great almoner of public charity throughout the United States" (p. 603). Justice McReynolds wrote two early decisions using the Fourteenth Amendment to protect civil liberties: Meyer v. Nebraska 262 U.S. 390 (1923), and Pierce v. Society of Sisters 268 U.S. 510 (1925). Meyer involved a state law that prohibited the teaching of modern foreign languages in public schools. Meyer, who taught German in a Lutheran school, was convicted under this law. McReynolds, in overturning the conviction on substantive due process grounds, wrote that the liberty guaranteed by the Due Process Clause of the Fourteenth Amendment included an individual's right "to contract, to engage in any of the common occupations of life, to acquire useful knowledge, to marry, to establish a home and bring up children, to worship God according to the dictates of his conscience, and generally to enjoy privileges, essential to the orderly pursuit of happiness by free men". These two decisions survived the post-Lochner era. Pierce involved a challenge to a law forbidding parents to send their children to any but public schools. Justice McReynolds wrote the opinion for a unanimous Court, holding that the Act violated the liberty of parents to direct the education of their children. McReynolds wrote that "the fundamental liberty upon which all governments in this Union repose excludes any general power of the State to standardize its children by forcing them to accept instruction from public teachers only". These decisions were revived long after McReynolds departed from the bench, to buttress the Court's announcement of a constitutional right to privacy in Griswold v. Connecticut 381 U.S. 479 (1965), and later the constitutional right to abortion in Roe v. Wade 410 U.S. 113 (1973). McReynolds wrote the decision in United States v. Miller 307 U.S. 174 (1939), which was the only Supreme Court case that directly involved the Second Amendment until District of Columbia v. Heller in 2008. In the field of tax law, McReynolds wrote for the Court in Burnet v. Logan, 283 U.S. 404 (1931), a significant decision setting out the Court's doctrine regarding "open transactions". McReynolds also wrote the dissent in the Gold Clause Cases, which required the surrender of all gold coins, gold bullion, and gold certificates to the government by May 1, 1933 under Executive Order 6102, issued by President Franklin Roosevelt. McReynolds was labeled "Scrooge" by journalist Drew Pearson. [C] Chief Justice William Howard Taft thought him selfish, prejudiced, "and someone who seems to delight in making others uncomfortable ... [H]e has a continual grouch, and is always offended because the court is doing something that he regards as undignified." Taft also wrote that McReynolds was the most irresponsible member of the Court, and that "[i]n the absence of McReynolds everything went smoothly." Early on, his temperament affected his performance in the court. For example, he determined that John Clarke, another Wilson appointee to the court, was "too liberal" and refused to speak with him. Clarke decided to resign early from the court, and said that McReynolds's open antipathy was one factor. McReynolds refused to sign the customary joint memorial letter for Clarke, which was always given to departing members. In a letter, Taft commented that "[t]his is a fair sample of McReynolds's personal character and the difficulty of getting along with him." Justice McReynolds, February 3, 1940. Taft wrote that although he considered McReynolds an "able man", he found him to be "selfish to the last degree ... fuller of prejudice than any man I have ever known ... one who delights in making others uncomfortable. He has no sense of duty ... really seems to have less of a loyal spirit to the Court than anybody." In 1929 McReynolds asked Taft to announce opinions assigned to him (McReynolds), explaining that "an imperious voice has called me out of town. I don't think my sudden illness will prove fatal, but strange things some time [sic] happen around Thanksgiving." Duck hunting season had opened and McReynolds was off to Maryland for some shooting. In 1925, he left so suddenly on a similar errand that he had no opportunity to notify the Chief Justice of his departure. Taft was infuriated as two important decisions he wanted to deliver were delayed because McReynolds had not handed in a dissent before leaving. McReynolds would go on tirades about "un-Americans" and "political subversives." Known as a blatant bigot,[D] McReynolds would not accept "Jews, drinkers, blacks, women, smokers, married or engaged individuals" as law clerks. Time "called him 'Puritanical', 'intolerably rude', 'savagely sarcastic', 'incredibly reactionary', and 'anti-Semitic'". McReynolds refused to speak to Louis Brandeis, the first Jewish member of the Court, for three years following Brandeis's appointment. When Brandeis retired in 1939, McReynolds did not sign the customary dedicatory letter sent to justices on their retirement. He habitually left the conference room whenever Brandeis spoke. When Benjamin Cardozo's appointment was being pressed on President Herbert C. Hoover, McReynolds joined with fellow justices Pierce Butler and Willis Van Devanter in urging the White House not to "afflict the Court with another Jew". When news of Cardozo's appointment was announced, McReynolds is claimed to have said "Huh, it seems that the only way you can get on the Supreme Court these days is to be either the son of a criminal or a Jew, or both." During Cardozo's swearing-in ceremony, McReynolds pointedly read a newspaper. He often would hold a brief or record in front of his face when Cardozo delivered an opinion from the bench. Likewise, he refused to sign opinions authored by Brandeis. According to John Frush Knox (1907–1997), McReynolds's law clerk for one term (1936–1937, following the seven-year clerkship of Maurice Mahoney), and one author of a memoir of his service, McReynolds never spoke to Cardozo at all. McReynolds did not attend the memorial ceremonies held at the Supreme Court in honor of Cardozo. He did not attend Felix Frankfurter's swearing-in, exclaiming "My God, another Jew on the Court!" In 1922, Taft proposed that members of the Court accompany him to Philadelphia on a ceremonial occasion, but McReynolds refused to go, writing: "As you know, I am not always to be found when there is a Hebrew abroad. Therefore, my 'inability' to attend must not surprise you." However, the oft-repeated story that McReynolds refused to sit for the 1924 Court photograph because of his hostility to Brandeis is untrue. McReynolds objected to taking a new photograph when there had been no change in the membership of the court since the 1923 photograph. Alpheus T. Mason misinterpreted this as hostility to Brandeis, but McReynolds sat for numerous photographs for which Brandeis (and later Felix Frankfurter) were present. Once, when colleague Harlan Fiske Stone remarked to him about an attorney's brief: "That was the dullest argument I ever heard in my life," McReynolds replied: "The only duller thing I can think of is to hear you read one of your opinions." "I've been a member of this club a good many years, and no one around here has ever shown me any courtesy, so I don't intend to show any to anyone else." The indignant chairman replied: "Mr Justice, you wouldn't be a member of this club if it wasn't for your official position. The members of this club have put up with your discourtesy for years, merely because you are a member of the Supreme Court. But I'm telling you now that the next time there is a complaint against you, you'll be suspended from the privileges of the golf course." Justices Pierce Butler and Willis Van Devanter transferred from the Chevy Chase club to Burning Tree because McReynolds "got disagreeable even beyond their endurance". When a female lawyer appeared in the courtroom, McReynolds would reportedly mutter: "I see the female is here again." He would often leave the bench when a woman lawyer rose to present a case. He thought the wearing of wrist watches by men to be effeminate, and the use of red fingernail polish by women to be vulgar. He forbade smoking in his presence. He is said to have been responsible for the "No Smoking" signs in the Supreme Court building, inaugurated during his tenure. He would announce to any Justice who attempted to smoke in conference that "tobacco smoke is personally objectionable to me". Any who tried "were stopped at the threshold". McReynolds's long-suffering African-American domestic servants – subject to the Justice's racism – gave him the nickname "Pussywillow." But McReynolds was reportedly "extremely charitable" to the pages who worked at the Court, and had a great love of children. For example, he gave very generous assistance and adopted thirty-three children who were victims of the German bombing of London in 1940, and left a sizable fortune to charity. After Oliver Wendell Holmes's wife died, McReynolds broke down and wept at her funeral. Holmes wrote in 1926: "Poor McReynolds is, I think, a man of feeling and of more secret kindliness than he would get credit for." He would often entertain at his apartment, and passed cigarettes to his guests on occasion. He often invited people for brunch on Sunday mornings. According to William O. Douglas, "On these informal occasions in his own home he was the essence of hospitality and a very delightful companion." Once, when riding to his office on a street car, a drunk got on board and fell out in the aisle. McReynolds picked him up, helped him back to his seat, and sat beside him until they reached the top of Capitol Hill, leaving him only after giving explicit instructions to the conductor. When he was required to preside in court, due to absence of more senior justices, "he was the soul of courtesy, graciously greeting and raptly listening to the arguments by lawyers of both sexes." The public Justice McReynolds was noted for his hospitality. He entertained frequently at the Willard Hotel with guest lists of 150 people, including his fellow justices, and at an annual eggnog party that was one of the social highlights of the Christmas season. Alice Roosevelt, one of many friends, requested the services of his cook, Mrs. Parker, for her wedding breakfast to Nicholas Longworth. After a substantial hearing loss in 1925, McReynolds strongly intended to resign from the Court, and was only dissuaded by requests from many friends to continue, pronouncing him "one of the few who have courageously stood for the rights of property and of the citizen." He assumed senior status on January 31, 1941, effectively resigning from the court. He lived at the Rochambeau apartment complex in Washington, D.C. from 1915 until Roosevelt requisitioned the Beaux Arts building in 1935 for his New Deal requirements. McReynolds found a new apartment at 2400 Sixteenth Street, where he lived until his death on August 24, 1946. McReynolds never married. The five other Supreme Court justices who never married are, in order of service, William Henry Moody, Benjamin Cardozo, Frank Murphy, David Souter, and Elena Kagan. McReynolds was buried in the Elkton Cemetery in Elkton, Kentucky. Elkton residents fondly remembered him, pointing out both his home and office "with great pride and respect". Knox wrote "in 1946 he [McReynolds] died a very lonely death in a hospital – without a single friend or relative at his bedside. He was buried in Kentucky, but no member of the Court attended his funeral though one employee of the Court traveled to Kentucky for the services." In contrast, as the clerk noted, when McReynolds's aged African-American messenger, Harry Parker, died in 1953, his funeral was attended by five or six Justices, including the Chief Justice. McReynolds's brother, Robert, had visited him in the hospital shortly before his death. In his will, McReynolds requested "let there be no service in Washington". The U.S. Marshal for the Supreme Court traveled to Elkton for the funeral. The Christian Science Monitor hailed McReynolds in tribute as: '"the last and lone champion on the Supreme Bench battling the steady encroachment of Federal powers on State and individual rights ... standing these later years at the Pass of Thermopylae." McReynolds bequeathed his entire estate to charity. Among these bequests were additional funds to Children's Hospital in Washington, which he had supported for years, adding a new elevator, $10,000 and the residue of his estate. His books and opinions were left to the Library of Congress, and $10,000 and his judicial robe to Vanderbilt University, where he had served for 30 years on the Board of Trust. McReynolds's papers are held at many libraries around the country, namely: mainly at the University of Virginia Law School in Charlottesville, Virginia; Harvard University Law School in Cambridge, Massachusetts, Felix Frankfurter papers; John Knox papers (1920–80), available at the University of Virginia and Northwestern University; University of Kentucky at Lexington, Kentucky, William Jennings Price (1851–1952) papers; University of Michigan Bentley Historical Library at Ann Arbor, Michigan, Frank Murphy papers; Minnesota Historical Society, St. Paul, Minnesota Pierce Butler papers; Tennessee State Library and Archives in Nashville, Tennessee, Robert Boyte Crawford Howell papers; University of Virginia, Charlottesville, Virginia, Homer Stille Cummings papers. Fictionalized versions of McReynolds appear in two alternate history works by Harry Turtledove: a segment of the multi-volume Southern Victory Series (where he appears as a Confederate citizen) and the standalone novel Joe Steele. McReynolds was the subject of episode 283 of the podcast The Dollop. ^ One block from the Todd County courthouse, it is listed on the National Register of Historic Places Inventory. ^ This is the title of the chapter dedicated to McReynolds in Pearson & Allen (1936). ^ "[McReynolds] was a headache ... He would not speak to Brandeis, was clearly anti-Semitic, and was a disruptive force." ^ "James Clark McReynolds". Federal Judicial Center. 2009-12-12. Archived from the original on 2009-05-14. Retrieved 2009-12-12. ^ Shoemaker, Rebecca S. (2004). The White Court: Justice, Rulings, and Legacy. Santa Barbara, California: ABC-CLIO, Inc. p. 86. ^ National Register of Historic Places Inventory/Nomination: McReynolds House. National Park Service, 1976-06, 3. ^ Smith, Megan (Summer 2006). "Supreme Court Associate Justice James Clark McReynolds (1862–1946): Principled Defender of the Federal Constitution" (PDF). The Upsilonian. Upsilon Sigma Phi. 17: 1. Archived from the original (PDF) on May 28, 2010. Retrieved 2010-11-17. ^ a b "James C. McReynolds". Supreme Court Historical Society. Retrieved March 21, 2012. ^ "United States vs. American Tobacco, 221 U.S. 106, syllabus". Justia.com. 1911. Retrieved March 20, 2012. ^ "United States vs. American Tobacco, 221 U.S. 106 full text opinion". Justia.com. 1911. Retrieved March 20, 2012. ^ a b c "James Clark McReynolds, Attorney General". Department of Justice. Retrieved March 20, 2012. ^ U.S. vs. American Tobacco Company, 221 U.S. 106. Argued January 3, 4, 5 6, 1910; re-argued January 6, 9, 11, 12, 1911. ^ a b Bush, Cornelia. "James Clark McReynolds". footnote.com. Retrieved March 21, 2012. ^ a b c Fox, John. "James Clark McReynolds". Capitalism and Conflict: Supreme Court History, Law, Power & Personality, Biographies of the Robes. Public Broadcasting System. Retrieved March 19, 2012. ^ a b c d e "James C. McReynolds". Oyez Project Official Supreme Court media. Chicago Kent College of Law. Retrieved March 20, 2012. ^ a b c d Ariens, Michael (2002–2005). "James Clark McReynolds". Michael Ariens website. Retrieved March 19, 2012. ^ a b Lucas, Roy (2004). "The Forgotten Justice James Clark McReynolds & The Neglected First, Second & Fourteenth Amendments". Washington, D.C. Retrieved March 21, 2012. ^ Taft, Charles P. Swindler, William F. (ed.). My Father the Chief Justice, Yearbook 1977. The Supreme Court Historical Society. p. 8. ^ Kaufman (1998), p. 480, attributed to Paul A. Freund at a talk delivered before the Harvard Law School Forum, March 7, 1977, from Kaufman's notes. ^ Liptak, Adam (December 10, 2018). "The Stories Behind the Supreme Court's Class Photos". The New York Times. Retrieved December 10, 2018. ^ Christensen, George A. (1983). "Here Lies the Supreme Court: Gravesites of the Justices". Journal of the Supreme Court Historical Society. Archived from the original on September 3, 2005. at Wayback machine. ^ Christian Science Monitor, August 27, 1946, p. 16. ^ "Inventory of the Papers of Justice James Clark McReynolds 1819–1967". Collection Number Mss 85-1, A Collection in The Arthur J. Morris Law Library, Special Collections. University of Virginia. Retrieved March 19, 2012. ^ Federal Judicial Center, James Clark McReynolds Resources. Abraham, Henry J. (1999). Justices, Presidents, and Senators: A History of the U.S. Supreme Court Appointments from Washington to Clinton. Lanham, MD: Rowman & Littlefield. ISBN 0-8476-9604-9. Abraham, Henry J. (2008). Justices, Presidents, and Senators: A History of the U.S. Supreme Court Appointments from Washington to Bush II (5th ed.). Lanham, MD: Rowman & Littlefield. ISBN 978-0-7425-5894-6. Atkinson, David (1999). Leaving the Bench: Supreme Court Justices at the End. University Press of Kansas. ISBN 978-0-7006-1058-7. Baker, Leonard (1984). Brandeis and Frankfurter: A Dual Biography. New York, NY: Harper Collins. ISBN 0-06-015245-1. Ball, Howard (2006). Hugo L. Black: Cold Steel Warrior. Oxford University Press. ISBN 0-19-507814-4. Baker, Liva (1991). The Justice from Beacon Hill: the Life and Times of Oliver Wendell Holmes. New York, NY: Harper Collins. ISBN 0-06-016629-0. Bickel, Alexander C.; Schmidt, Benno C., Jr. (1985). "The Judiciary and Responsible Government 1910–21". History of the Supreme Court of the United States. 8. New York, NY: Macmillan Publishing Company. Burner, David (1969). "James C. McReynolds". In Friedman, Leon; Israel, Fred (eds.). The Justices of the United States Supreme Court 1789–1969: Their Lives and Major Opinions. New York, NY: Chelsea House Publishers. ISBN 978-0-8352-0217-6. Bush, Ann McReynolds (2010). Executive Disorder: The Subversion of the United States Supreme Court, 1914–1940. Cornelia Wendell Bush. ISBN 9781453652640. Douglas, William O. (1980). The Court Years 1939–1975: The Autobiography of William O. Douglas. New York, NY: Random House. ISBN 0-394-49240-4. Hall, Kermit L., ed. (1992). The Oxford Companion to the Supreme Court of the United States. Oxford, UK: Oxford University Press. ISBN 0-19-505835-6. Hall, Kermit L. (2005). "McReynolds, James Clark". The Oxford Companion to the Supreme Court of the United States. Oxford, UK: Oxford University Press. ISBN 978-0-641-99779-2. Jones, Calvin P. (1983). "Kentucky's irascible conservative: Supreme Court Justice James Clark McReynolds". Filson Club History Quarterly. 57: 20–30. Kaufman, Andrew L. (1998). Cardozo. Harvard University Press. ISBN 0-674-09645-2. Knox, John (2002). The Forgotten Memoir of John Knox: a Year in the Life of a Supreme Court Clerk in FDR's Washington. Edited by Dennis J. Hutchinson & David J. Garrow. University of Chicago Press. ISBN 978-0-226-44862-6. Mason, Alpheus Thomas (1964). William Howard Taft: Chief Justice. London: Oldbourne. Pearson, Drew; Allen, Robert S. (1936). The Nine Old Men. New York, NY: Doubleday, Doran, and Company, Inc.
Pringle, Henry F. (1939). The Life and Times of William Howard Taft: A Biography. 2. New York, NY: Farrack and Rinehart, Inc.
Schlesinger, Arthur M., Jr. (1960). The Politics of Upheaval: 1935–1936, the Age of Roosevelt. 3. Boston: Houghton Mifflin. Warner, Hoyt Landon (1959). The Life of Mr. Justice Clarke. Cleveland, OH: Western Reserve University Press. James Clark McReynolds at the Biographical Directory of Federal Judges, a public domain publication of the Federal Judicial Center. "McReynolds, James Clark," Dictionary of American Biography. "McReynolds, James Clark," American National Biography. Biographical Dictionary of the Federal Judiciary. Detroit: Gale Research, 1976. Bibliography on James Clark McReynolds at 6th Circuit United States Court of Appeals. Frank, John P. (1995). Friedman, Leon; Israel, Fred L (eds.). The Justices of the United States Supreme Court: Their Lives and Major Opinions. Chelsea House Publishers. ISBN 0-7910-1377-4. Biography, James Clark McReynolds at Federal Judicial Center. Supreme Court Historical Society, James C. McReynolds. This page was last edited on 8 March 2019, at 23:54 (UTC).